…and boy, was it was a difficult week. 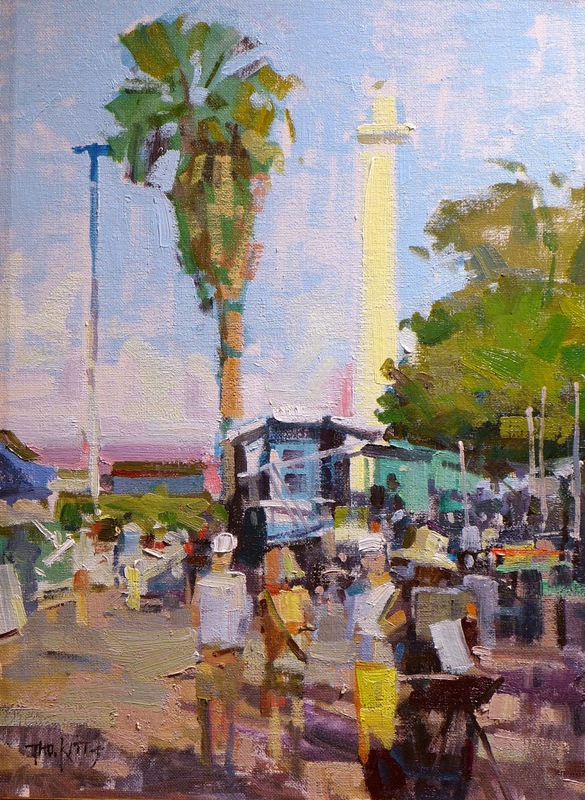 Obviously, I am not complaining, because hey, it was Maui in February and I got to paint in the sun. But still, it was a difficult week. The weather started off well on the first day but stopped cooperating on day two and then kept fussing about until the day before we turned our paintings in. There was the vog, there was the overcast, there was the rain. And early in the week there was some unexpected transportation problems. On top of all that, on Monday I lost my wallet somewhere on the island and found myself without cash or credit cards. Reduced to bumming rides from fellow painters while I waited for replacements. So as mentioned – a difficult week. 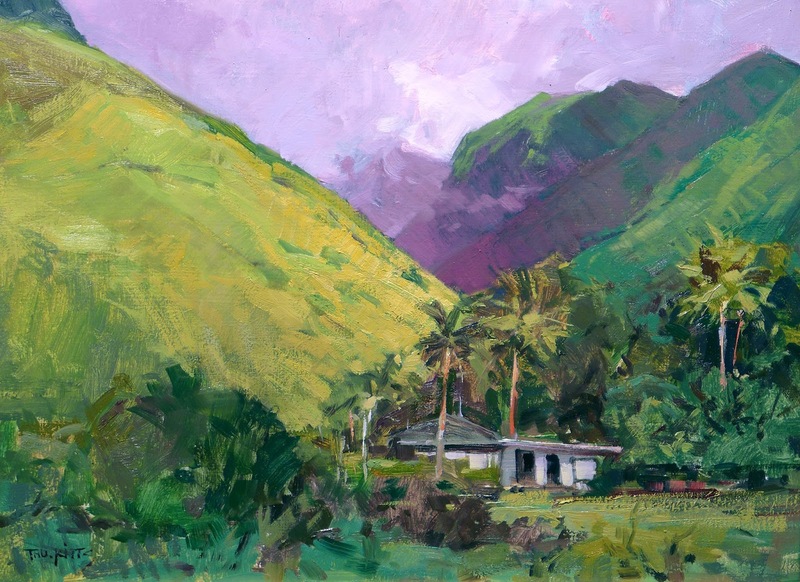 But hey, let me repeat: I was on Maui, surrounded by friends, and there to paint – not to mope or complain. My problems were of the first-world order, and in paradise to boot, so it was important to keep telling myself that! I think the best thing about doing these events is the caliber of the people you meet. Our fellow painters, the event organizers, our hosts, and the collectors and general on-lookers who get excited about what we do. I don't think this changes from place to place. It seems to be the same everywhere I go. 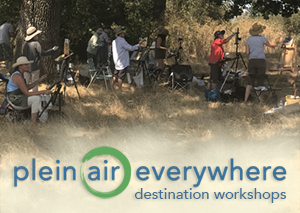 I can't say what the experience is like in other genres of art but the plein air milieu is filled with folks who just want to help. Even a cashless, cardless, (and now carless) artist freaked out about how to get from point A to point B without becoming a drag. But it turned out I had to decline more rides and offers of assistance than was needed to accept and that was a moving moment for me. Kindness teaches a lesson. So thank you Ned, Mary, Keith, Barbara and Wally, Pierre, Jenny, Jeanne, and everyone else who lent a hand. Without you the week would have been worse. I not only owe you, I want to pass it on. As I keep saying – it is Maui. A place filled with the Aloha Spirit, a way of life that goes beyond greeting someone with hello and goodbye. After all, how bad could things get in paradise? I may have felt penniless and temporarily itinerant (and in truth I was neither) but this experience helped me refocus on what is truly important. Painting. I am grateful and humbled by that. So the big lesson for me last week was: When life give you a bunch of lemons break out the cadmium yellow light. Sorry about the crappy iPhone copy shot. It was our opening event of the week and I barely remembered to take a snapshot during the three hour paint out. The Jodo Mission Buddha is the largest sitting Buddha in the US as far as I know. It has a greenish cast which reflects all sorts of interesting colors from whatever is around it and the contra jour illumination interested me. I want to come back and paint it again at a larger scale. Little did I know as I painted this that I'd be needing a little serenity myself. The irony doesn't escape me. Painted during a rainy afternoon while waiting for my friends to come back from a whale watching tour. I would never have purposely chosen this as a subject but it turned out to be one of my favorite paintings of the week. I liked it so much I came back to this same spot for the QuickDraw at the end of the week. The Jodo Mission is an interesting place to paint. Located towards the northern end of Lahaina, it offers a refuge from the intense activity of the town. I like painting there for the quiet atmosphere. 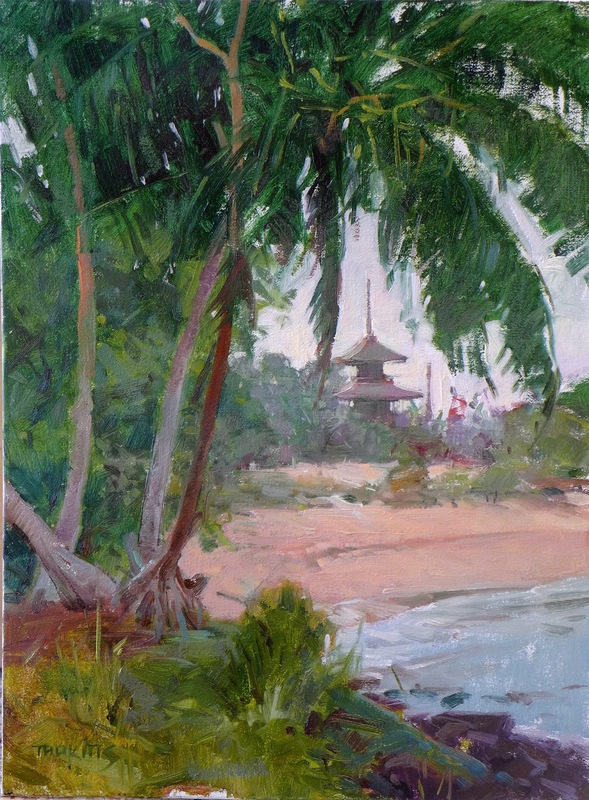 This is an unusual view of the pagoda, largely unnoticed and seen from the backside of Mala Harbor. When I arrived the 'Vog' had settled in to create the oddest light I have ever tried to paint. The vog erupts out of the volcanos on the main island and when it blows in it tints everything pink and gray. (Believe it or not, the sun is setting directly behind the cloud cap in the center of the painting. 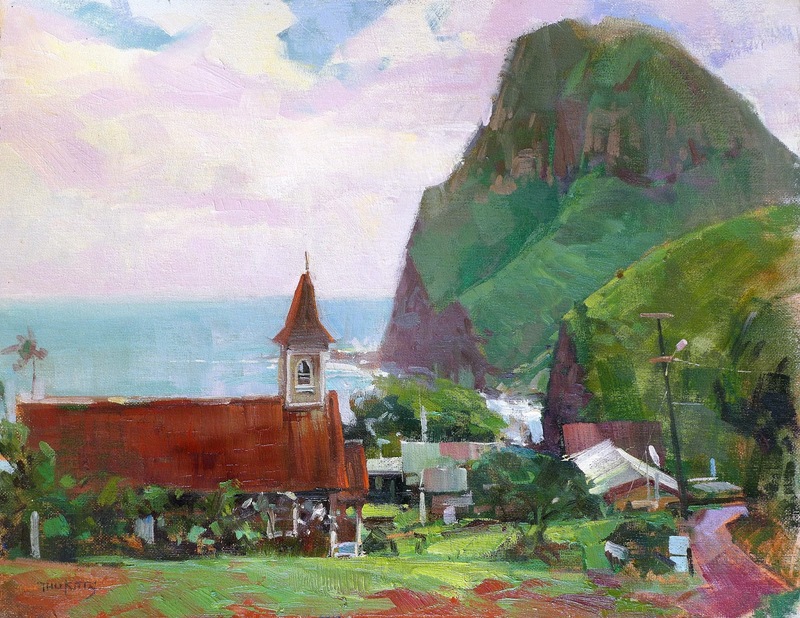 Pink and gray is not the usual palette you find in Hawaiian art but that is what was there. Sometimes I can be an idiot with my painting titles. I identified this painting as 'Molokai Sunset' on the opening night. When a kindly local corrected me I re-wrote out the title card somewhat embarrassed. It's important to get the islands right because someone will notice. Green. Green. Green. Maui is green. Especially after all the rain they had before we showed up. I'm from the Pacific Northwest – you know, the wet part, so you can either choose to paint it as you see it, or gray the greens down. I painted them as they are. Ned Mueller, Colin Page, David Santillanes, and Hai-Ou and I drove up into Olowalu Canyon, past the general store, past the 300 year old petroglyphs, to this hidden spot. And we had to contend with the clouds coming and going all afternoon, which is Nature's way of toying with the plein air painter. David's version garnered the People's Choice Award. It was well deserved. This is my other favorite painting of the week. On Wednesday afternoon the sun came out for good and I was alone so I wasn't distracted. It was just me, the sun, and the painting. And hordes of tourists constantly passing by along the seawall. (Such is the life of the urban plein air painter…) However, there was amazing contrast between the lights and darks looking towards the south, and yet the color remained strong, so I had to paint it. We are essentially looking into the sun as it is dropping into the upper right corner, which is why the sky is so light. This is what happens when you look into the sun in the tropics. What you think is blue sky, isn't. Even though there can be a lot of blue reflected into the water. And shallow water being what it is, if clear like this was, you start seeing into it as it comes up to you in the foreground. That blue to green, contrasted by the reddish wet sand, was like crack cocaine for me. It had to go down. This beach is as about as Hawaiian as it gets on Maui. It is public sandy crescent with shade and services, and the kids can wade into the water line all day long while parents can lounge or snorkel the reefs immediately offshore. When I take a dip I always encountering turtles in the murky wash, and once a spotted eel came up to my face mask unexpectedly. (Not an experience I wish to have again. All I remember of that moment was a circle of fine teeth pointing inwards with a big hole in the middle.) This painting is so impressionistic because I wanted to play with little daubs of color, with the idea that the image will pull together if you stand back. Dang, those French knew what they were doing! Yes, the harbor again, but this time in sunlight. For those who may not know, a QuickDraw is a bit like the TV show, 'The Iron Chef'. They both contain an aspect of contrived competitiveness, and to a degree some showmanship. 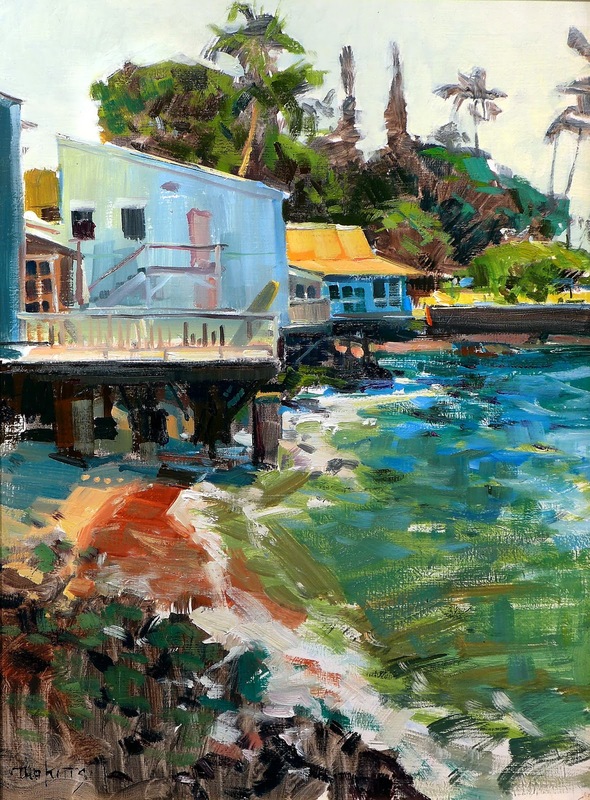 All of us artists are expected to set up in a small confined and very public area, in this case the harbor itself, and knock out a finished piece within a short period of time. We may paint at any size we wish but it must be complete before the horn goes off. In this case we had two hours. Then, after the horn we must tear down and pack everything up, and frame our quickdraw before bringing it to the gallery to be hung for the Gala show later that evening. No worries, no stress, right? It's kind of a publicity stunt and everyone tries to have fun while doing it. 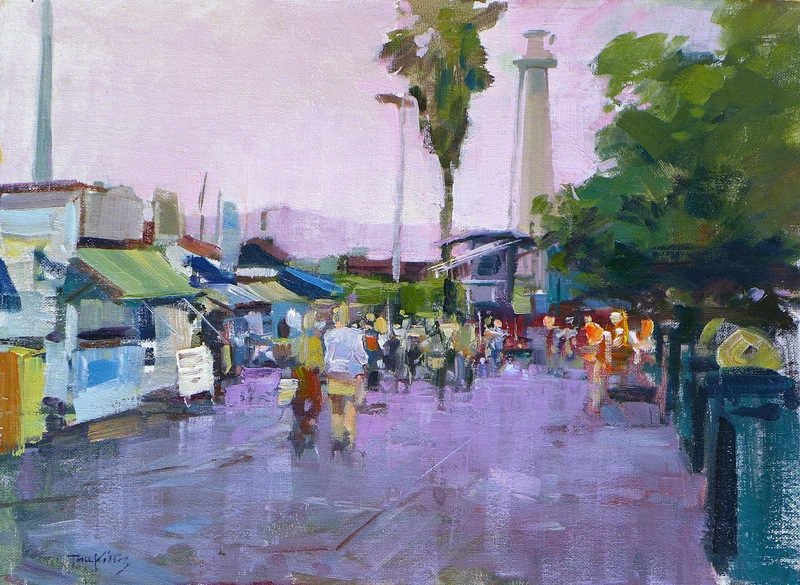 I try to execute all my plein air work as if they are quick draws, so standing in the middle of a curious public mob and fielding questions or wise-cracks and working at a fast clip is no big deal. It makes doing stand-up comedy in a club look easy except I'm not funny. (heh!) I think all the quickdraws I've done are largely responsible for the improvement I've seen in my own work over the past five years. 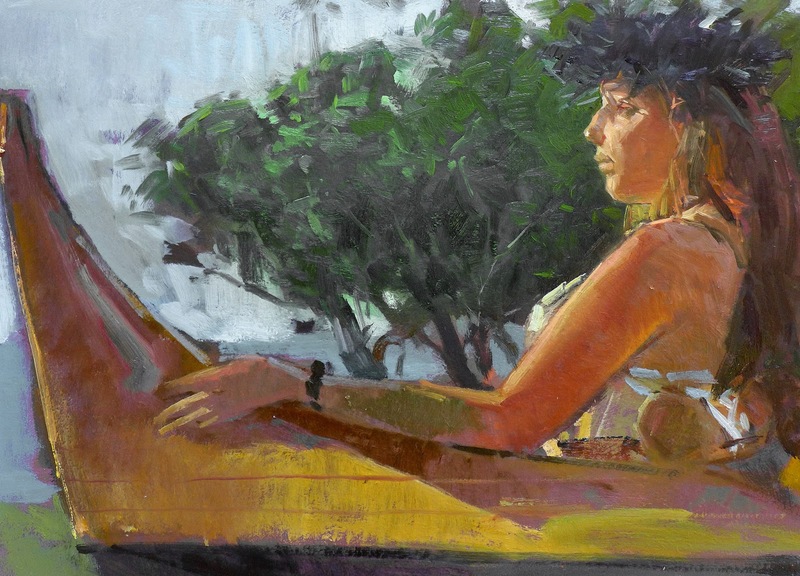 So I like doing them and specifically encourage my workshop students to paint fast and furious too – and if necessary – not to worry about picking up the pieces afterwards. 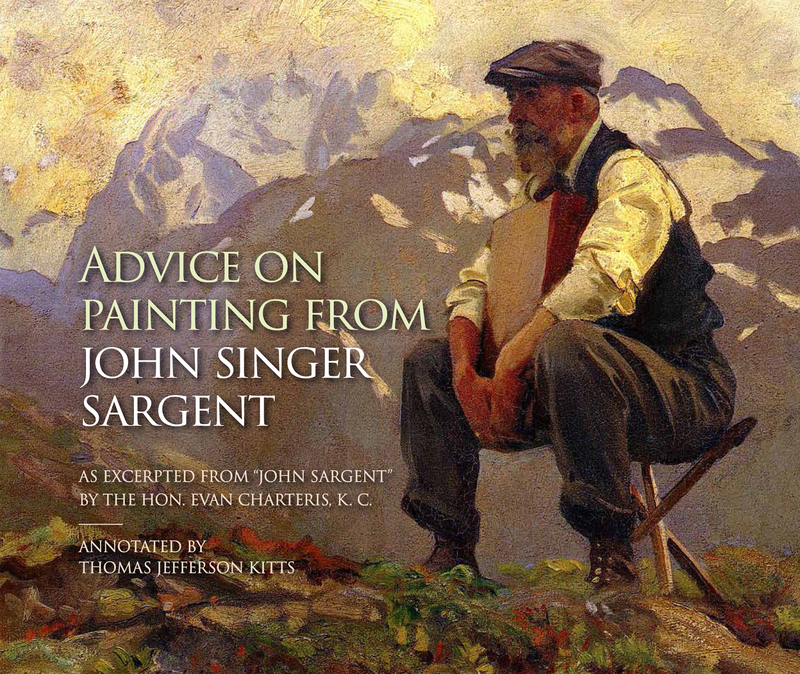 After all, no matter how good or bad a painting may turn out it's still just a painting. You can let it go and move on to the next one without beating yourself up about it. Facebookers and anyone else unable to view this video: click here! I want to thank all the event organizers and participating artists for the good times and chance to come paint at the 9th Annual Maui Invitational this year. It really was an exceptional event! Great paintings. Could almost feel the surf. And about that eel? As I've always said, I'm not going into any environment where I'm not the top of the food chain. What an interesting week Thomas. Can't imagine a missing wallet would make anyone feel comfortable though. Ugh and more ugh! Through it all, the work looks great and makes me wish for white washed sands and sounds of crashing waves. 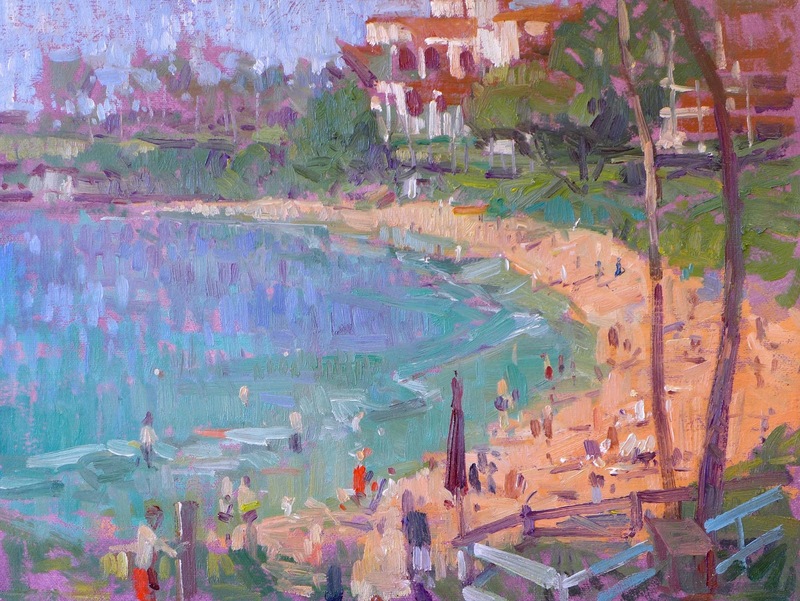 Love the impressionist piece of the beach at Kapalua Bay, as well as Lahaina Harbor Rain and especially like Hide-A-Way. And thanks to you too, Brenda. I could go back to Kapalua Bay any day of the week to paint and snorkel. Even with the eels and tiger sharks that are known to lurk out there. That's nature for you: red in tooth and claw. 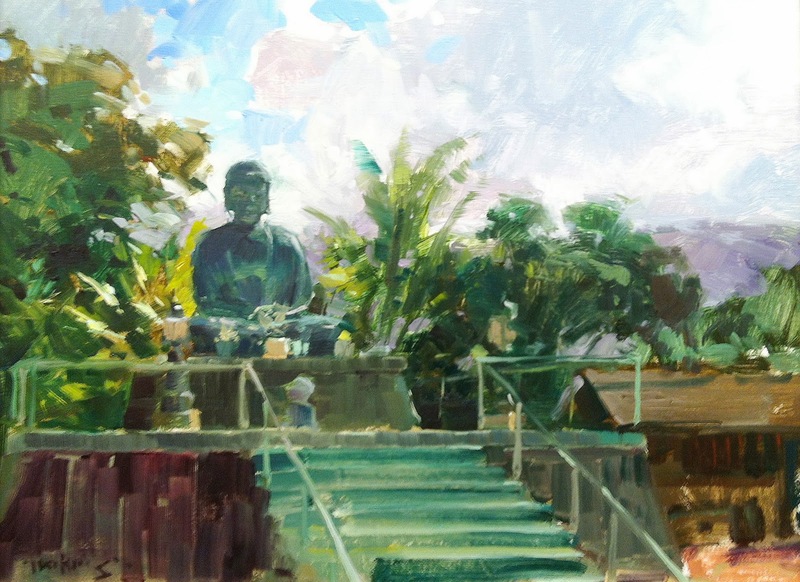 The Buddha statue impresses me --all those greens and you really caught the dazzling sunlight of Hawaii. I, too, like that water meeting the warmth of the sand in "Back to Front". Wonderful paintings..all of them! Thanks Celeste. I appreciate your kind words.